I have written two blogs on SMAB charges in ICICI bank and how it is affecting normal customers of ICICI bank. I have received numerous complaints on the same charges by HDFC bank. HDFC also deduct money from accounts like ICICI bank. I will explain what is AMB charges and how it is deducted. The full form of MAB is Minimum Monthly Average Balance. It means that the account holder should keep a minimum account in their accounts. The minimum balance varies with banks and types of accounts. If you take a Regular Savings Account in HDFC bank, you can freely use Net Banking, Phone Banking and Mobile Banking and they will not deduct Annual Maintenance Charge (AMC) for the first year for the first new Demat account. You can also use facilities like Safe Deposit Lockers, Sweep-In and Super Saver facilities. However a minimum balance is needed for Regular Savings Account in HDFC bank. There comes the problem. They will deduct certain amount of money from your account which are called as AMB and AQB. AMB means Average Monthly Balance and AQB means Average Quarterly Balance. So if you go the website of HDFC bank and see how they have explained AMB, you will get the idea. "A minimum deposit of Rs. 10,000 (metro/urban branches), Rs. 5000 (semi-urban/rural branches) is required to open an account and thereafter an AVERAGE MONTHLY BALANCE of the same amount has to be maintained"
"It is mandatory to maintain a minimum AMB (Average Monthly Balance) of Rs. 10,000 (metro/urban branches), Rs. 5000 (semi-urban), Rs. 2500 AQB (rural branches). If the balance is not maintained, the following service charges will be levied"
Now let us look in to the service charges deducted by HDFC bank. In Semi Urban areas, HDFC bank will deduct 300 rupees from your account, if your minimum balance in savings account goes below 2,500 rupees. Sometimes these service charges are deducted without informing the customers. ICICI bank is notorious for deducting money like this from their customers. Hence complaints arise. If you have not informed of the deduction of money, you should check your statement and go to the bank and ask them and have every right to approach the court. HDFC bank provides these information in their website and I request you to read it. I have shared the link to the same above. QAB means Quarterly Average Balance. In SBI, if QAB is not maintained, penalty of 544 Rs is charged. 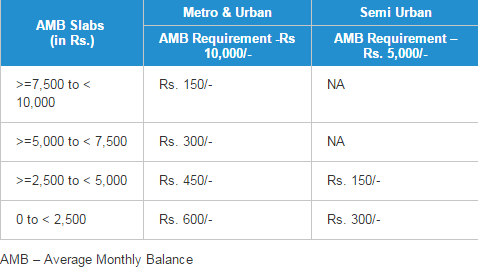 Check the post on What is MAB, QAB And ATM Service Charges in SBI Bank?